An innovative lunchbox for kids and adults. Every day, many Australians are packing nutritious lunches to sustain them for the day ahead, whether it’s for the school grounds, the office, a sporting event or a travel expedition. Often, lunchboxes are bulky, unattractive and not all that effective at keeping home-made meals tasting fresh. Fortunately, innovative lunchbox and drink tumbler company, Vaya Life, has made its way to Australia. Vaya Life’s functional and beautiful tyffyn lunchboxes and drynk tumblers make daily meal prep and lunchtime much more exciting. Australians can now get the full home cooked experience on-the-go, without sacrificing style. Already popular across the Asia Pacific, Germany, UK and USA, Vaya Life is known for its sustainable and aesthetic tyffyn lunchboxes, which keeps food hot or cold for five to six hours in VacuTherm insulation. The slim stainless steel body features a distinctive stack style structure with partitions and leak proof lids to make carrying multiple dishes a breeze. The range comes in 600ml and 1000ml sizes and the on-trend metallic and matte colours suit all preferences and styles. The inner stacked stainless steel containers come in either an elegant copper finish (classic tyffyn) or a lighter polished finish (tyffynlyte) for two different weights and looks. For the little ones, there is the tyffynkyds range, which features a 600ml body in a selection of fun and bright patterns. The drynk range includes insulated drink tumblers in two sizes, 350ml and 600ml. The tumblers keep liquids hot for 12 hours or cold for 18 hours in a slim stainless steel body. Each tumbler comes with two different lids, the sipper and the gulper, to ensure that every beverage can be enjoyed in any setting. The sipper lid is designed for hot beverages and comes with a magnetic latch that keeps the cap open for easy sipping. The gulper lid has a wide mouth to allow users to guzzle down colder liquids or pour out beverages to share into the two accompanying cups. In addition to the core ranges, Vaya Life also offers add-on accessories such as multipurpose carry bag/mats, cutlery and cleaning tools to accompany the tyffyn and drynk products. Tyffyn is the most advanced thermally insulated lunchbox in the world. The range has been designed using state-of-the-art technology to ensure the food stays hot or cold, to prevent spills and to fit easily into carry bags. 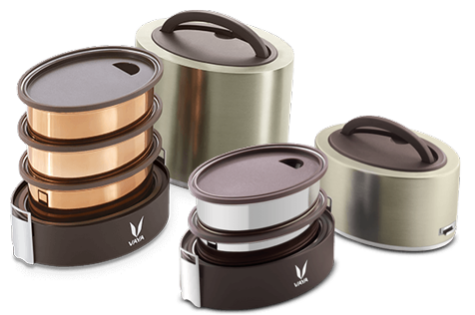 Tyffyn is made of the highest food grade stainless steel and the lids are made of shatter-proof durable FDA approved BPA free plastic. Similarly, drynk is made with the best-in-class materials for consumer food-ware that is stain and corrosion resistant. Both the ranges are safe to take on planes. Vaya Life products are available for purchase at vayalife.com/au-en/products. RRP of the tyffyn lunchboxes start from $69 and $46 for the drynk tumblers.